The first Indian consignment comes days after Bangladesh High Commissioner in New Delhi Syed Muazzem Ali met Foreign Secretary S Jaishankar last week and briefed him about the problems faced by Dhaka due to the influx of the refugees. India on Thursday rushed 53 tonnes of relief materials to Bangladesh and pledged all help to Dhaka in tackling the humanitarian crisis after nearly 400,000 Rohingya Muslim refugees fled to the country from Myanmar following the ethnic violence in the Buddhist-majority nation. “Operation Insaniyat: High Commission handed over 1st consignment humanitarian assistance by India to Bangladesh,” the Indian mission here tweeted. The first Indian consignment comes days after Bangladesh High Commissioner in New Delhi Syed Muazzem Ali met Foreign Secretary S Jaishankar last week and briefed him about the problems faced by Dhaka due to the influx of the refugees. “India stands ready to provide any assistance required by Government of Bangladesh in this hour of need,” an Indian External Affairs Ministry statement said on Thursday. It said New Delhi always responded readily and swiftly to any crisis in Bangladesh, in keeping with the close ties of friendship between the peoples of the two countries. 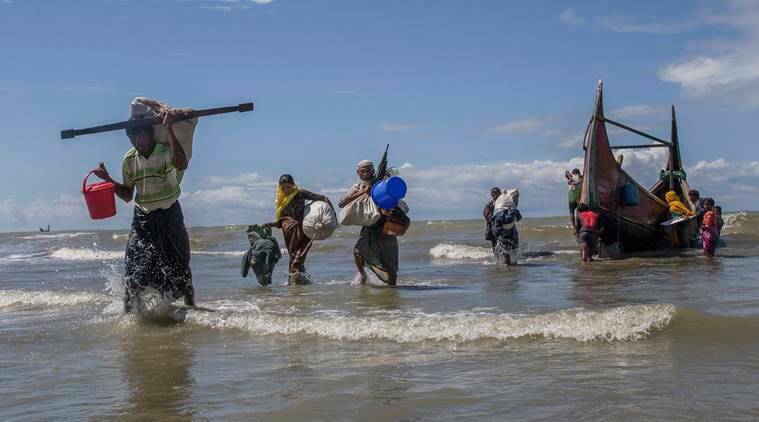 “In response to the humanitarian crisis being faced on account of the large influx of refugees into Bangladesh, Government of India has decided to extend assistance to Bangladesh,” the ministry said. The relief material consists of items required urgently by the affected people, namely rice, pulses, sugar, salt, cooking oil, tea, ready to eat noodles, biscuits, mosquito nets, tents etc. efforts to handle the situation. Shringla said India has expressed “deep concern” at the recent spate of violence in Myanmar, resulting in the outflow of a huge number of refugees into Bangladesh. “This has created unprecedented challenges for Bangladesh,” he said. The envoy said India appreciated Bangladesh for “making every effort to deal with the urgent requirements of food, clothing and shelter for the large number of refugees that have placed a huge demand on its resources”. He said the situation prompted India to provide urgent humanitarian assistance in consultation with Bangladesh. “We are arranging to supply to each and every family of newly arrived refugees a 15-kg pack consisting of parboiled rice, lentils, sugar, salt, biscuits, milk powder and other edibles, in addition to soap, mosquito nets and other items of utility,” he said. He said several additional planeloads with relief supplies were expected to arrive over the next few weeks in coordination with the Government of Bangladesh. The Indian mission said Quader likened the aid to India’s assistance to Bangladesh during the 1971 Liberation War. Bangladesh, which is facing a big influx of Rohingyas from Myanmar, has called on the international community to intervene and put pressure on Myanmar to address the exodus. According to the UN estimates, around 400,000 Rohingya Muslims have fled Myanmar’s Rakhine state into Bangladesh since August 25 when fresh wave of violence erupted. According to reports, the violence began when Rohingya militants attacked police posts in Myanmar’s Rakhine state. Rohingya residents – a stateless mostly Muslim minority in a Buddhist-majority nation – allege that the military and Rakhine Buddhists responded with a brutal campaign against them, according to the reports. Bangladesh has stepped up diplomacy to get support of the major stakeholders like China and Russia in mounting pressure on Myanmar to stop atrocities in the Rakhine state and take back their nationals. The UN Security Council with China being one of its five permanent members on Wednesday took a unanimous resolution expressing “deep concern” about violence in Myanmar. Bangladesh had earlier said the new influx of Rohingya refugees is an unbearable additional burden on the country which has been hosting around 400,000 Myanmar nationals who had to leave their country in the past due to communal violence and repeated military operations.